One of the best ways for frustrated parents, students and teachers to convince school leaders that it's time for a reboot is with amazing student work. An unconventional learning community of "makers" -- people who like to figure out and fix problems with their hands -- stands ready to demonstrate a hands-on learning style in which students engage problems that matter to them, taking agency and displaying creativity along the way. 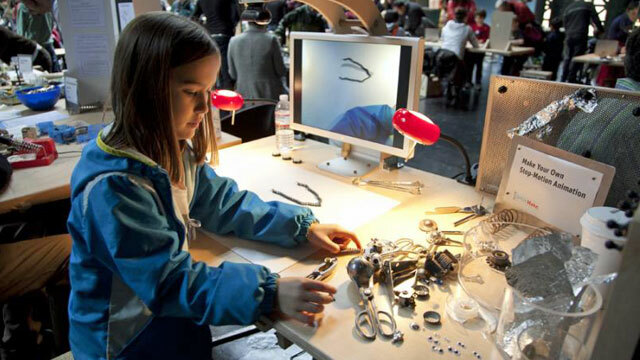 The Maker Movement is slowly infiltrating schools across the country with the help of dedicated educators and inspirational students proving with their creations that they can do incredible things when given a chance. “People are seeing through the eyes and the hands and the screens of children what's possible, and it's re-energizing progressive views of education," said Gary Stager, co-author with Sylvia Libow Martinez of "Invent to Learn," a book about the Maker Movement. "The only way to change big systems is one step at a time, and the first step is any first step." Martinez and Stager believe that schools could learn a thing or two from the Maker Movement, a community of learners using their free time to design and build solutions to problems they see around them. Martinez made a compelling argument to educators gathered in Atlanta for the International Society of Technology in Education that there's no better time to launch maker spaces in schools than now. The movement has taken off worldwide, and there are lots of free or inexpensive tools available, making it easier for schools to begin experimenting. "School is a big system," Martinez said. "When you push it one way, it pushes back." That's one reason it can feel so hard to incorporate an alternative idea like maker spaces into traditional schools. It's not easy to give kids freedom to produce creative solutions to complex problems in just 40 minutes. But teachers who believe in it have to start somewhere if they want to make change. "The only way to change big systems is one step at a time," she continued. "And the first step is any first step. You just have to try these things and do them." Martinez suggests picking one thing that could work in an individual school's specific environment and to move on from there, rather than trying to do it all at once and ending up delaying the project because it's the wrong time, there's no money or support from leadership -- or one of the many other common obstacles preventing changes in education. "I think kids are more in tune with this outside world that cares about what they think and what their passions and talents are, and they know school doesn't have it," Martinez said. That's why a child programming a robot one minute is crying and fighting over having to do worksheets later the same night. So far, education has treated the kind of tinkering valued in maker communities as a goofy activity before the serious learning, not as the core lesson itself. "Making is a stance about learning," Martinez said. "It's the landscape you create in a classroom or any kind of learning space where kids have agency over what they do and a large choice of materials that are rich, deep and complex." Creating a space where kids identify and solve problems is also one goal of the Common Core standards taking hold in many states. "You guys can figure this out," Martinez told ISTE educators. "You can change your curriculum to fit these ideas. You don't need to wait for a professional development session. The whole world is out there to help you out." Martinez says it's as simple as giving students a real-world problem and then inviting flexibility and student agency into the classroom. "The student shouldn't have to report which step they are on or always make a brain map," Martinez said. But they should be given lots of room to try and fail. The iterative process is part of what gives students ownership over the problem and its solution. It's also what makes figuring it out so sweet. "As a teacher it's your job to think about what standard that ticks off," Martinez said. "It's a different way of looking at standards." It's about allowing students' passions to run away with them and then recognizing that in the process the student was learning core skills required by the standards. "The standards are calling for more authentic connections, for deeper learning," Martinez said. "There are connections in every subject area." Perhaps one of the most inspiring results of the Maker Movement is the creative confidence young people are developing. "The best thing that happens is a student completely exceeds your expectations," Martinez said. And when students do things they didn't realize they could do, they feel empowered. "We want kids to approach any challenge in the world and say, 'Cool, I can figure it out,' " Martinez said. The Maker Movement's power comes not from a specific set of tools but from embracing an approach to learning that has fallen out of favor over the past several decades. "We are at the peak of inflated expectations," Martinez said. "A 3-D printer will not change your school. Going shopping will not change school; it never has, it never will." Yet the tools available now are much less expensive than they used to be. 3-D printers are no longer out of reach for some school budgets, even though they are infamous for misprints and other funny failures. There are many free design programs online like SketchUp and Tinkercad, not to mention online repositories for design templates. These are great bases for students to modify. If there is one tool Martinez recommends for a teacher starting down the maker path, it's the MaKey MaKey. It's a very simple small board that allows a user to connect the computer to any object that can conduct even a little electricity. It uses alligator clips and a USB plug-in and has no other software needs. The starter kit costs $50. One high school engineering design class interviewed students at a special needs school about their favorite games. Then they used MaKey MaKeys to design a special interface for each child to more easily interact with the game. Incredible maker projects have come out of the cheapest disposable supplies, too. Cardboard is a favorite, but conductive materials like El wire, copper tape, foil, conductive ink, fabric and graphite pencils are also crowd pleasers. The website for Invent to Learn is a great resource for materials and ideas. "You have to believe strongly in how you think learning happens and then you can evaluate the tools," Martinez said. "If the tool is a toy and it's not going to help students have agency in the long run, then it might not be the tool you want." She cautioned educators against packaged products that make the process sound simple. "Easy sounds good, but complexity is good as well," Martinez said. "You want kids to grapple with complex things." Kids want to make an impact on the world and very often they are more motivated by contributing to the common good than to anything else. Many kids will design and build incredible things, but then put their templates online so someone else can improve on it. Those are the qualities educators should try to nurture in students. "All we have to do is open up the classroom doors a little bit and let them change the world," Martinez said. "Because they want to." One way Stager and Martinez have been helping teachers become more comfortable with the Maker Movement and its potential in the classroom is to give them space to invent and create themselves. Every summer they run a Constructing Modern Knowledge Workshop, in which educators come together and remember what it's like to be a learner, trying new things for the first time. "The teachers learn through their own experiment that things don't have to be as they seem, that their classrooms could be freer," Stager said. This year the four-day workshop had 200 participants, most of whom had no experience with the tools or concepts of making. One group wanted to make a self-watering plant. They figured out how to measure soil moisture with an electric charge, and created a probe out of a nail and a connector that they designed on CAD and 3-D printed. 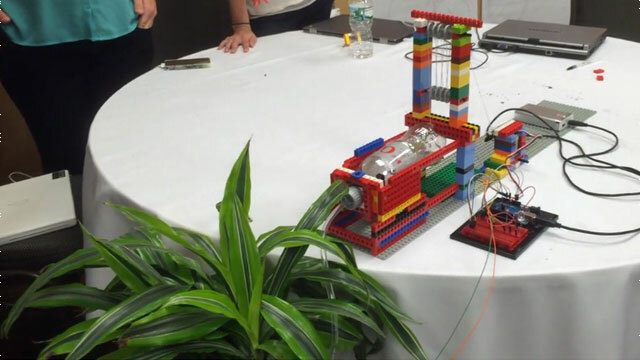 They even made a robot out of Legos to pour water on the plants when the soil conditions indicated the time was right. Teachers were amazed at their own ingenuity and the power of working in groups. They wanted to bring that same wonder back to their students. One teacher became very frustrated with the process and intended to leave. She took a walk to cool down and decided she wanted to try again. At that moment she realized her students never have the opportunity to walk away from a problem or get the space to reflect. Instead, she constantly drives them to stay on task. "Part of the problem is we have a generation of teachers who have never been taught anything other than curriculum delivery," Stager said. That dynamic may be changing slowly as teachers get excited about hands-on learning and students demonstrate the incredible things they invent, build and share.